Bare® by Solo® food containers are perfect for holding hot foods (with a maximum temperature of 205°F). These versatile containers can also be used with cold food for immediate consumption. The PLA lining on the inside of the container acts as a moisture barrier to prevent leaking, while the matte finish on the outside of the container conducts less heat to your fingertips. The squat profile and wide mouth make this product easy for operators to fill and easy for customers to eat from. 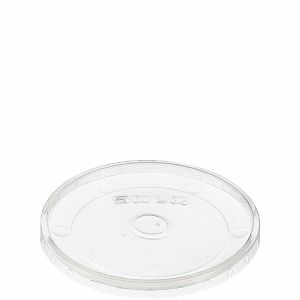 Single Sided PLA coating on the inside of the container acts as a moisture barrier to keep liquid inside the container.